In September, 2017 the Lightning, Panthers, NHL and NHLPA announced a joint donation of $2.7 million for hurricane relief to those affected across the state of Florida. 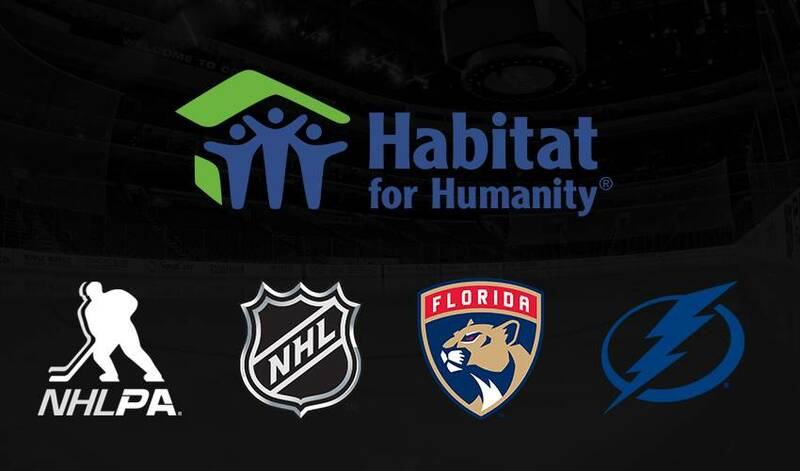 PANTHERS, LIGHTNING, NHL AND NHLPA BUILD HOMES AFFECTED BY HURRICANE IRMA IN PARTNERSHIP WITH HABITAT FOR HUMANITY TAMPA/SUNRISE/NEW YORK/TORONTO (Jan. 16, 2018) – The Florida Panthers, Tampa Bay Lightning, National Hockey League Players’ Association (NHLPA) and National Hockey League (NHL) have partnered with Habitat for Humanity of Collier County (“Habitat Collier”) to help restore the community of Immokalee, Fla., a rural agricultural neighborhood in Collier County that suffered severe damage during Hurricane Irma. In September, 2017 the Lightning, Panthers, NHL and NHLPA announced a joint donation of $2.7 million for hurricane relief to those affected across the state of Florida. Today, the hockey community combined efforts to use funding from this donation to help build new homes, sharing Habitat for Humanity’s goal to create safe, affordable housing that is accessible to hard working families. Extensive damage was caused to the entire state of Florida by the Hurricane. Negative impacts have been felt by millions of people in many different ways across the state, including Miami/Ft. Lauderdale, Naples, Lakeland, Tampa Bay and Jacksonville. Today, volunteers in Immokalee, Fla. helped to build new homes, assisting with framing walls, hanging siding, painting, and laying sod. For more information and to watch video footage from the build, visit NHLPA.com or NHL.com.